Accompanied by a prominent heraldic escutcheon that is larger than his face, the powerful Creole Don Juan Xavier Joachín here poses in a dazzling European-style costume and powdered wig appropriate to his station. A lengthy inscription emphasizes his court appointments, among them a lifetime position as governor of the Philippines. Spain began granting titles of nobility to elite individuals in the New World shortly after the European conquest. 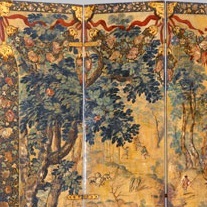 This biombo enconchado—which originally included six additional panels, now in Mexico—is the only known work to combine the two elite Mexican genres of biombos (folding screens) and tableros de concha nácar y pintura (shell-inlay paintings, later known as enconchados). Commissioned by José Sarmiento de Valladares, viceroy of New Spain, it was most likely displayed in Mexico’s viceregal palace, where it would have divided a ceremonial state room from a more intimate sitting room. The scene from the Great Turkish War (1683–99) after a Dutch print on its front side was an ideal propagandistic backdrop of Habsburg power for the reception of the viceroy’s official international visitors. 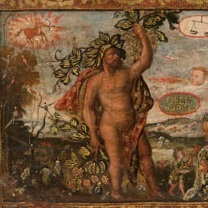 The decorative hunting scene on the reverse, also based on a European print source, was better suited for a more intimate room like the cuadra de estrado. 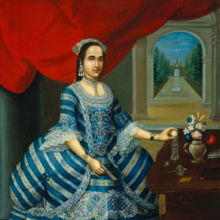 Doña Mariana Belsunse y Salasar is portrayed in her Lima home dressed in a brilliantly embroidered tobajilla (ankle-length gown). She stands at her dressing table before an arched entry that gives way to a manicured landscape and the grand archway of the Paseo de Aguas leading to the Plaza de Acho, Lima’s famed bullring founded by Doña Mariana and her husband. 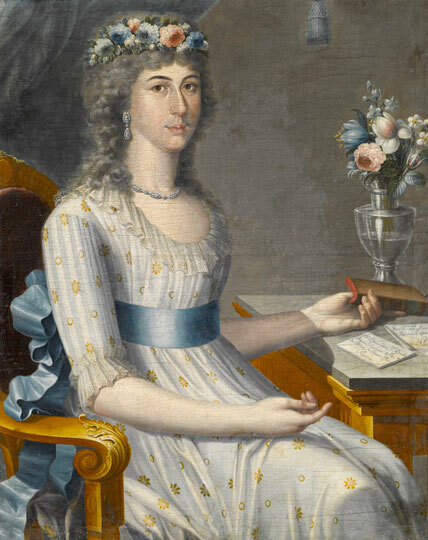 The sitter became a leading social figure and hostess of a salon frequented by the countess of Monteblanco and Montemar and others of the Creole and peninsular Spanish elite. Doña Mariana was best known, however, as a central figure in one of Lima’s most notorious social scandals of the day. 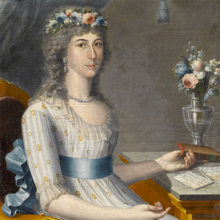 Her hand was initially promised to Hipólito de Landaburrú, many years her senior and allegedly “uglier than an excommunication.” This proposed marriage, famously unwanted and unconsummated, was avoided when Doña Mariana entered the convent. Reemerging from the cloister in 1755, after her fiancé had died, she married Hipólito’s wealthy nephew, Colonel Agustín de Landaburrú y Rivera, Lima’s alcalde (mayor). One way that Creoles in the New World elevated their rank within the empire’s socio-racial hierarchy was by being admitted to chivalric orders in Spain. 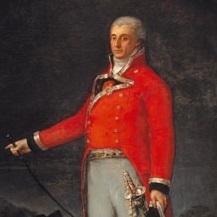 In this portrait painted in Madrid by the court artist Francisco de Goya, the Peruvian Tadeo Bravo de Rivero sports the cross and jeweled badge of the distinguished Spanish Order of Santiago on his jacket and left lapel. Tadeo Bravo studied in his native Lima, the capital of the viceroyalty of Peru, at the University of San Marcos and served as an officer there in the Royal Infantry. He eventually moved to Madrid and followed the path advocated by the former king, Charles III, who encouraged Creoles to hold government positions in Spain. 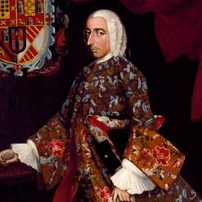 Tadeo Bravo’s ascent was a great achievement, since Spanish policies still favored peninsular Spaniards (those from the Iberian Peninsula) for top political and ecclesiastical appointments. 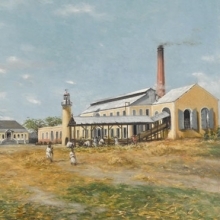 José Gallart, an enterprising émigré from Barcelona, commissioned the Puerto Rican Creole painter Francisco Oller to paint “portraits” of his five Puerto Rican ingenios, or sugar-mill complexes. At age thirteen Gallart followed in the footsteps of Spain’s early conquistadors, sailing to the Indies to seek his New World fortunes. In 1885 Gallart returned to Spain and displayed Hacienda La Fortuna in the study of his home outside Barcelona as a reminder of the source of his newfound American wealth. Gallart died in Spain in 1898, one day before the end of the Spanish-American War, which liberated Puerto Rico and Cuba from more than four hundred years of Spanish rule. Although indigenous people ranked below Spaniards in Spanish America’s social order, direct descendants of pre-Hispanic nobility were afforded certain political privileges, including the right to hold office in local government. In order to legitimize claims to noble lineage in the viceroyalty of Peru, members of the Inca elite often conspicuously displayed Europeanized portraits of their ancestors, the fourteen ancient Andean rulers, in their homes. The Inca had no pictorial portraiture tradition before the conquest. 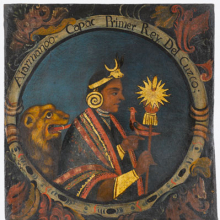 Soon after European contact, however, series of Inca kings painted by local artists in European portrait styles started to appear in indigenous and Creole inventories. The bust-length portrait series to which this painting belongs is based on a 1615 Spanish engraving. Around 1764, the British government sent the painter Agostino Brunias to the West Indies to represent the islands’ multiethnic population. 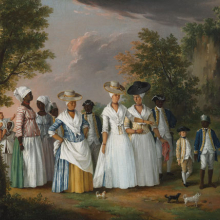 The figures in Brunias’s British colonial paintings present a spectrum of skin tones and often demonstrate the failure of traditional European markers to convey racial identity and status in the New World. Here, in the company of their African servants, two prosperous Caribbean-born women of mixed race wear fine pearls and European clothing. One of them, apparently the mistress of the plantation on the island of Dominica, gestures to a blond boy who may be her son. Brunias’s pictures were conspicuously displayed in elite Dominican interiors, where, as symbols of status and wealth, they reflected and reinforced the aristocratic pretensions of the island’s new moneyed class of sugar planters. The drinks served in the Spanish American cuadra de estrado varied from region to region. In South America coca-leaf teas and yerba maté, a tea-like beverage made from the dried leaves of a mild stimulant, were favored. 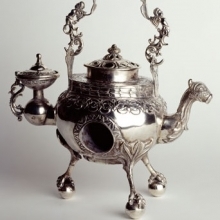 Indispensable for preparing and serving these drinks were boxes and tea caddies for the herbs, silver water heaters called pavas, silver filtering straws called bombillas, and silver maté cups. The shapes of maté cups reflect those of local gourds, which were originally used to serve the beverage. This Peruvian leather-bound chest is painted on the front with large allegorical figures flanking smaller Old World aristocrats. The sides show figures with their servants on the grounds of a country estate. The chest was most likely commissioned by a member of Peru’s privileged class for proud display in a reception room, where it would have functioned as a signifier of its owner’s erudition and education. Inside, fine imported textiles, which in colonial Peru were worth more than their weight in silver, were stored. Behind Closed Doors primarily consists of works from the Brooklyn Museum’s world-renowned collections as well as exceptional loans from distinguished institutions and private collectors. It is the first presentation of our important Spanish colonial holdings since the groundbreaking 1996 exhibition Converging Cultures: Art & Identity in Spanish America. The exhibition is accompanied by a comprehensive catalogue, available in print and as an e-book, with contributions by leading scholars of Colonial Spanish and British American art, published by the Brooklyn Museum in association with The Monacelli Press.